WHEN photographer Christoph Samlal saw the Progressive Empowerment Party (PEP) in March last year protesting against the Cybercrime Bill and standing up for the media he saw a party he could join. "I felt I could become involved with these people and their ideology." And that fateful day led to the 25-year-old Samlal becoming the PEP's candidate for Barataria in the July 16 by-elections. He spoke about his party and the campaign last week at PEP's headquarters at Stanmore Avenue, Port of Spain. He said the ideology of the party was about accountability and transparency and being a member of the party, he saw PEP build policies, solidify them and he was allowed to have a say. He was looking forward to contesting the general election but then the by-election was "sprung." "I stepped up to the plate one time." He said the response to his campaign so far has been pretty good. "Nobody is sold on the previous parties; they either open (to a new party) or jaded by politics. Nobody said they don't want a third party." Samlal said his constituency had infrastructure but the issue was lack of maintenance of the infrastructure. There are also problems with sidewalks, roadways and signage, issues with mosquitoes and sand flies, and the business community all want more police presence. He said when out campaigning people were not aware of the party and the biggest hurdle was getting to word out throughout such a large district. His family was never heavily involved in politics and have been supportive of his candidacy. He said a major difference between PEP and other "third force parties" was that the previous parties had broken off existing parties and included old politicians. "PEP is like none before. No recycled politicians." 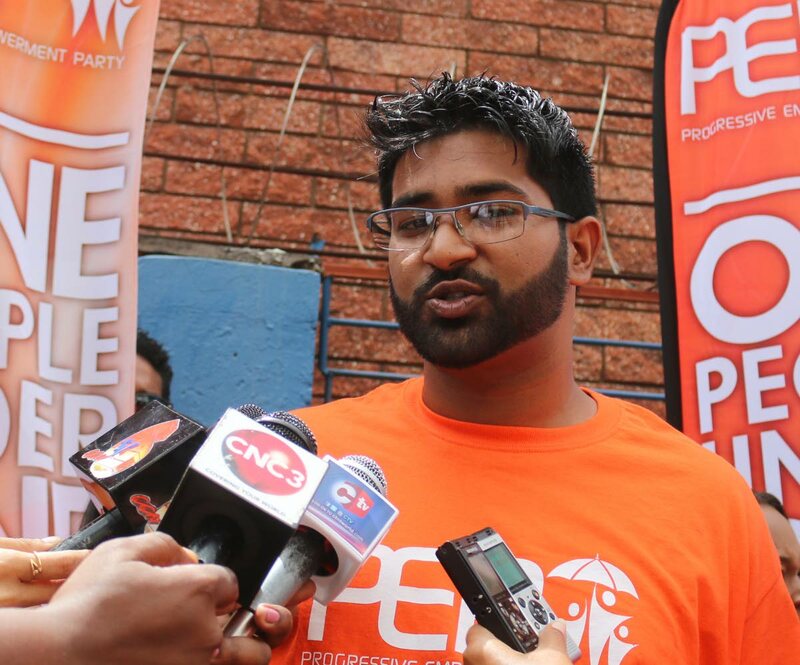 Samlal was also asked about PEP leader Phillip Edward Alexander and whether his controversial posts could impact on his party's chances in the by-election. "I joined this party not because of personality but because of the policies. So even when he might make a comment that I find uncalled for, I remind myself that it's not the personality I'm here for. There's a bigger picture and the thing that unites us is the politics and the things we want to see enacted and sooner or later he and I still end up discussing it and I see things his way either way." He said sometimes Alexander's comments spark more conversations across the country. "Which is what we intend to do. Certain things we don't discuss that we need to discuss, for example, the race issue or the bacchanal politics that has been going on. These are the things we need to talk about. And his comments – whether they be abrasive or not – is the catalyst for that to happen then so be it,"
He said the comments engage people to question things and discuss problems and solutions among themselves. "And then hopefully they will demand better afterwards." Samlal said plans leading up to the election includes a family day on July 7 at the Barataria Oval. "Make Barataria a community again." He said his strategy when talking to voters was inform them about what local government is, what it means to them and what their vote was worth to them. He said he would them open up the idea of a third party. Samlal said PEP was about representation and about the people and not just for the benefit of business owners. He added the Constitution was set up to serve the people and it was what the PEP aimed to do. Reply to "Samlal: No recycled politicians"